Rose plants shipped to your door. A slightly fragrant. bush rose with shiny. mid-green leaves. Pretty double golden yellow flowers produced from summer to autumn. A fragrant. climbing rose with leathery. green leaves. Clusters of pretty semi-double. white flowers. produced from summer to autumn. . Flowers from June to September. Deciduous. A large-flowered bush rose with dark green leaves. Pretty deep velvet red flowers with a little scent produced from summer to autumn. Flowers from June to September. A large-flowered bush rose with dark green leaves. Pretty. fully double. red flowers with a little scent produced from summer to autumn. Flowers from June to September. Semi-glossy green leaves and creamy-white flowers that bloom from summer until autumn. A fragrant. large-flowered bush rose with glossy. dark green leaves. Pretty fully double. rose-pink flowers. flushed peach. produced from summer to autumn. Flowers from June to September. Deciduous. Foliage colour Green. 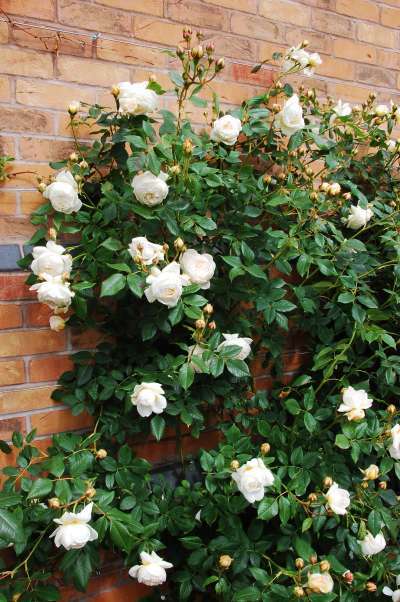 A fragrant cluster-flowered climbing rose with glossy pale green leaves. Pretty double pure buttercup yellow flowers produced from summer to autumn. Flowers from June to September. Deciduous. Hardy. Planting instructions Back-fill with soil mixed with peat and a suitable fertiliser. 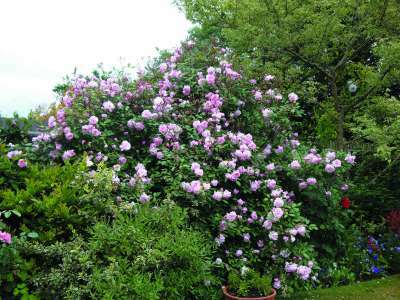 A climber with well formed silvery-lilac flowers strongly scented of lemons, produced freely. Flowers from June to September. Deciduous. Hardy. Planting instructions Back-fill with soil mixed with peat and a suitable fertiliser. A climbing rose with dark green leaves. Scented. fully double. salmon-pink flowers suffused apricot produced from summer to autumn. Height 3m. Spread 2.5m. Flowers from June to September. Deciduous. Hardy. Planting instructions Back-fill with soil mixed with peat and a suitable fertiliser. Large eye catching rose, flowers are full and the fragrance is spicy. Tolerant of shade and poor soil. Flowers in June. You will need to spray to prevent the onset of mildew. Dark red blooms with velvety texture. Growth is vigorous with dense glossy foliage. Good disease resistance, repeats well. Height: 10 feet. Repeats flowering. Cupped buds of a pale lemon shade which gradually open to form large, creamy-white flowers of typical English Musk delicacy; their petals perfectly arranged in concentric circles, with a few more loosely arranged in the centre. 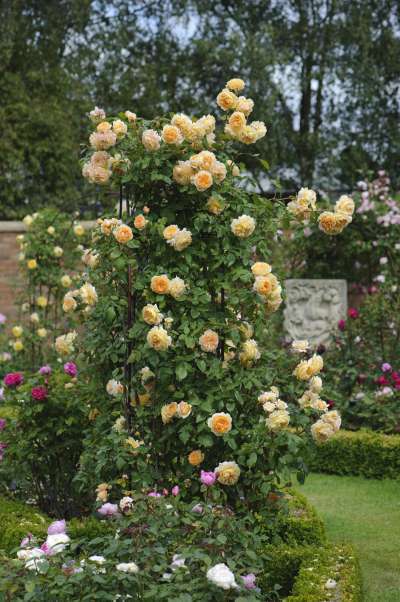 A hardy deciduous climbing rose. 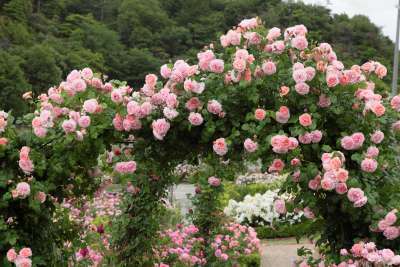 It is best planted in moist, well drained soil, and grows to an ultimate height of 2.6m - 4m over 2 - 5 years. 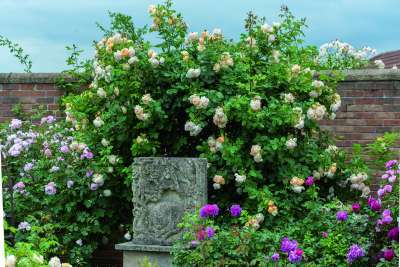 A strong growing variety bearing large, cupped, fragrant blooms. Large, deeply cupped blooms of soft glowing pink, gradually turning lilac-pink. Pleasing fragrance with a hint of myrrh. A strong growing variety. Good for disease resistance. Repeat Flowering. Highly Fragrant. 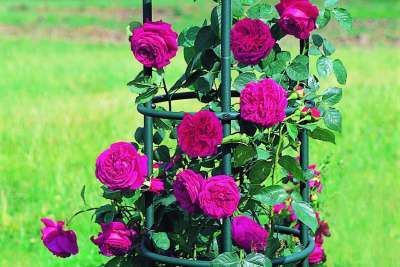 This rose bears medium-sized, pure rose pink, cupped rosettes of superb quality. 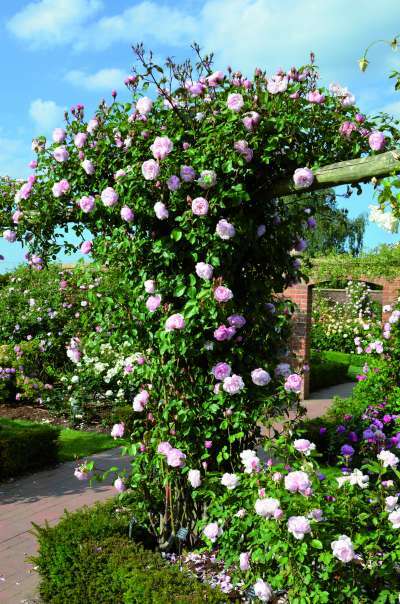 It can be trained as a beautiful short climber and is extremely healthy. A strong, delicious myrrh and heather honey fragrance. Height 6-8ft. 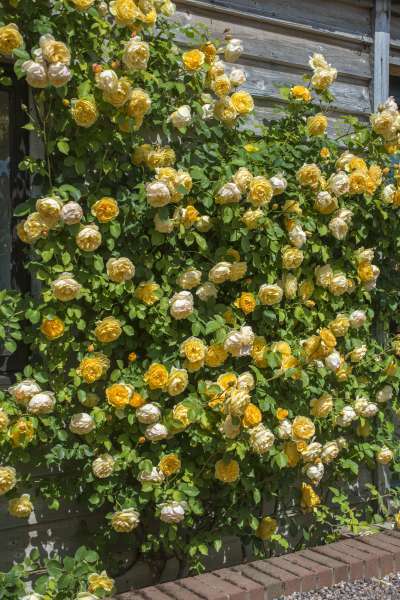 A fragrant climbing rose with a good strong yellow flower in summer to autumn. Foliage dark green. Height 3m. Flowers from June to September. Deciduous. Hardy. Planting instructions Back-fill with soil mixed with peat and a suitable fertiliser. A fragrant. climbing rose with glossy. dark green leaves. Pretty double. bright crimson flowers from summer to autumn. Can be pruned as a shrub. Height 3m. Spread 2m Flowers from June to September. Deciduous. Hardy. Planting instructions Back-fill with soil mixed with peat and a suitable fertiliser. An intensely fragrant. climbing rose with glossy. dark green leaves. Pretty. double. dusky red flowers from summer to autumn. Height 8ft. Suitable for growing in a large tub or on a patio. 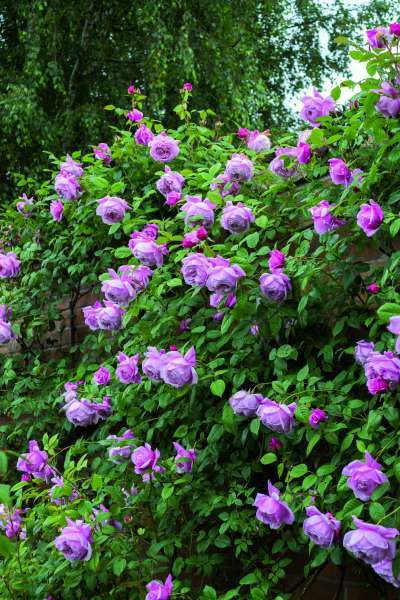 A fragrant climbing rose with glossy dark green leaves. Pretty double clear yellow flowers from summer to autumn. Height 3m. Spread 2m. Flowers from June to September. Deciduous. Hardy. Planting instructions Back-fill with soil mixed with peat and a suitable fertiliser. A fragrant. climbing rose with leathery. green leaves. Clusters of pretty semi-double. white flowers. produced from summer to autumn. Height 5m. Spread 2m. Flowers from June to September. Deciduous. Hardy. Planting instructions Back-fill with soil mixed with peat and a suitable fertiliser. A fragrant. rampant climber with light pale green leaves. Clusters of pretty. white flowers with the faintest hint of pink produced from summer to autumn. Height 4-5m. Spread 3m. . Flowers from June to September. Deciduous. A fragrant climbing rose with shiny mid-green leaves. Clusters of double pale. pearl pink flowers produced from summer to autumn. Height 3m. Spread 2.5m. Flowers from June to September. Deciduous. Hardy. Planting instructions Back-fill with soil mixed with peat and a suitable fertiliser. 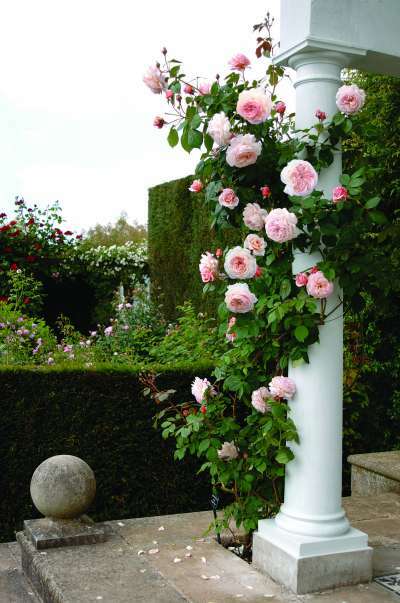 A shorter climber or pillar rose with beautiful rich pink blooms borne in clusters on stiff upright stems. The colour is wonderfully vibrant in the peak of the summer. Getting rather old now but still a cracking rose in the right position. Can be susceptible to black-spot. Can be grown in a container. 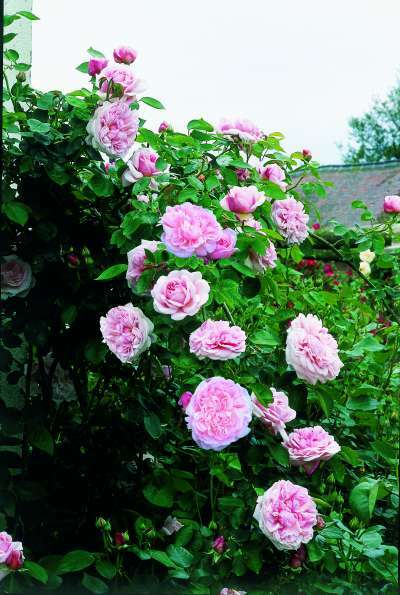 Climbing rose with numerous clear pink globular flowers produced from summer to autumn. Flowers from June to September. Deciduous. Hardy. Planting instructions Back-fill with soil mixed with peat and a suitable fertiliser. 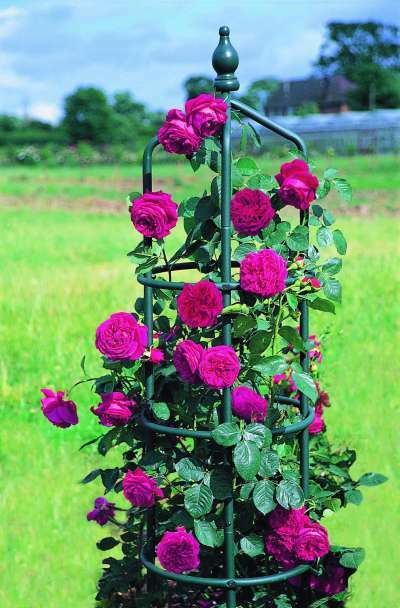 A good climbing rose with deep green leaves. Pretty loosely double deep pink flowers produced from summer to autumn. Flowers from June to September. Great for a north wall and almost thorn less. Deciduous. Hardy. Planting instructions Back-fill with soil mixed with peat and a suitable fertiliser. ROSE OF THE YEAR 2010. A stunning new variety that produces an abundance of beautifully formed butter yellow blooms throughout the flowering season. An unusual liquorice scent emanates from the sizable clusters of blooms. This rose has a compact habit with plenty of glossy mid green foliage which shows the blooms to a wonderful effect. A perfect bedding rose and well deserved winner of rose of the year. Grows to 80-100cm in height. Good disease resistance. Hardy. A slightly fragrant. cluster-flowered bush rose. vigorous & forming a shrub if required. Amber-pink flowers becoming a delicate shade of shell pink produced from summer to autumn. Height 1m. Spread 1m. Flowers from June to September. Deciduous. Hardy. Planting instructions Back-fill with soil mixed with peat and a suitable fertiliser. Drama Queen' is a free-flowering floribunda rose with red, pink and white striped flowers with a light scent. Mid green leaves. A fragrant. 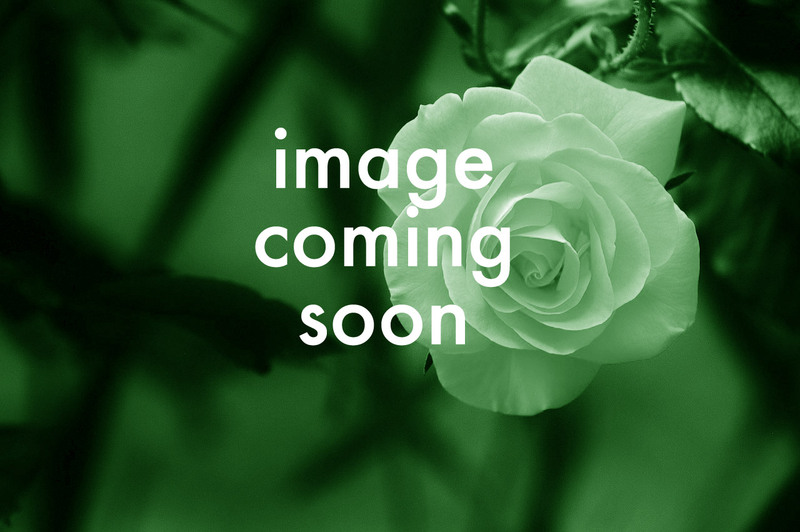 cluster-flowered bush rose with reddish green leaves. Pretty double. salmon-pink flowers. produced from summer to autumn. Height 1m. Spread 75cm. Flowers from June to September. Deciduous. Hardy. Planting instructions Back-fill with soil mixed with peat and a suitable fertiliser.